Despite that I rarely enter the kitchen anymore, I love using cooking analogies to describe time management in fast-paced, interdisciplinary teamwork. I’m pretty sure my team is sick of it and plotting to buy me a microwave for Christmas this year. Geophysical Society of Houston First VP-elect duties: Allow me to gush a bit about how much I love this local geophysical society. Over and above organizing and hosting technical talks and social events, we meet face-to-face each month, discuss and make reasonable plans with realistic direction, assign responsibilities to those fit to accomplish them, report successes and failures, and generally get things done. There is very little of the politics and faffing about associated with many other organizations, and we are all about offering the most to our membership in the greater Houston area. How? Every board member is a geoscience professional, and we have just two office personnel and several event volunteers. We are, however, an aging organization, so if you are a student or early- to mid-career applied geophysics professional in the Houston area and would like to give back to your local community, please get in touch in the Comments section below. We want your input and effort, and your future leadership! The SEG Women’s Network Committee (WNC): After two years as Chair, I handed the reins of our Committee and Network back to the Energizer bunny known as Maria Angela Capello, Chair 2013-15. Despite our best efforts, the succession plan fell apart. We were unable to convert an early-career member of the Women’s Network to a contributing/committee member to a leader. It is so easy and lazy to blame millennials and spout suspect theories that they are asocial and cannot rally for their own good. Instead, I ask what the modern scientific society should become to attract students and young professionals, and convert them into longstanding members who take on leadership responsibilities. In order to answer that, a couple of other questions pop up: Coming up on the year 2020, is the scientific society still relevant? If so, what sort of community do young scientists want? My biggest reason for being a SEG and GSH member is to meet face-to-face and share “our” science and experiences as scientists. But, is that considered scientific community any longer? I’d pay big money to attend a SEG annual meeting dedicated just to this topic. Seriously, folks, we’re technical sessioning, postering, paneling and exhibiting ourselves into irrelevance. Or are we? Let’s talk about this. While no longer Chair of WNC, I am Vice Chair (interim *please, someone take my place, please*), Full Spectrum column contributor, author of reports and exhibits, and editor of the upcoming SEG Women eNewsletter. And general SEG busybody. Can’t stop, won’t stop. Mentoring365 is a program developed among Earth and space science organizations to facilitate sharing professional knowledge, expertise, skills, insights, and experiences through dialogue and collaborative learning. The program provides mentors and mentees with structured, relationship-building tools to develop and attain focused career goals. Mentors must be current members in one of the program sponsors, AGU, AWG, or SEG. More earth science societies will soon join us, but if you are currently associated with AGU, SEG and/or AWG, please become an earth and space science mentor or mentee! Also, listen to AGU’s Leslie Marasco and me talk about Mentoring365 in the next Seismic Soundoff podcast! Travel: The Virgin Islands and Beijing were great, but the highlight of my year was attending the Association for Women Geoscientists awards ceremony in Seattle. I was given their 2017 Special Recognition for my “efforts to build the relationship between AWG and SEG as we work together to tackle issues that face the recruitment, retention and recognition of women in the geosciences.” AWG is a great organization, and if you do great things on behalf of women geoscientists, you get to be honored alongside women like Kathryn D Sullivan (I’m not worthy!). Following the AWG event, I attended the joint AGI-GSA Societies meeting as a SEG representative, in which we discussed American Geoscience Institute’s proposed anti-harassment statement. More context here and here. A question I posed is if a statement is a policy and what about enforcement? Policies without enforcement are meaningless, so the next positive steps are education and consequences. Without these, there is no point to anti-harassment initiatives and hashtag movements – the disease will still remain in the tree. A meeting attendee offered that due process is a means of enforcement. Due process sounds good on the face of it, but the more I think about its implementation, the onus and burden of proof are placed on the individual harassed rather than on the harasser and makes for a great legal CYA maneuver (like the ever-popular corporate Training Video) rather than positive action. Then again, it also keeps a workplace from reflexively keeping or throwing out a harasser, and is an opportunity to formalize and document consequences for the harasser. More discussion required. Right, this has nothing to do with travel, but going somewhere to work on the future and politics of living is always so fulfilling. Speaking of the politics of living, I recently watched a Billboard songwriter roundtable that included Tori Amos. The interviewer asked a question on gender politics in the music industry and Tori recalled how she once told a producer to keep her music intact and market it as she had made it. “Sell me to [the music exec]. Why not? You guys have been selling us [women] for thousands of years.” Here’s the transcript of that whole great panel interview. All of life is political – where you work, how you live, who your friends are, what you eat, what you read, watch and listen to, where you travel – and it’s not like you detach from that truth because you tune out to pop tv shows, smartphone games or the beach. Instead, you’re probably even more locked in to your choices. 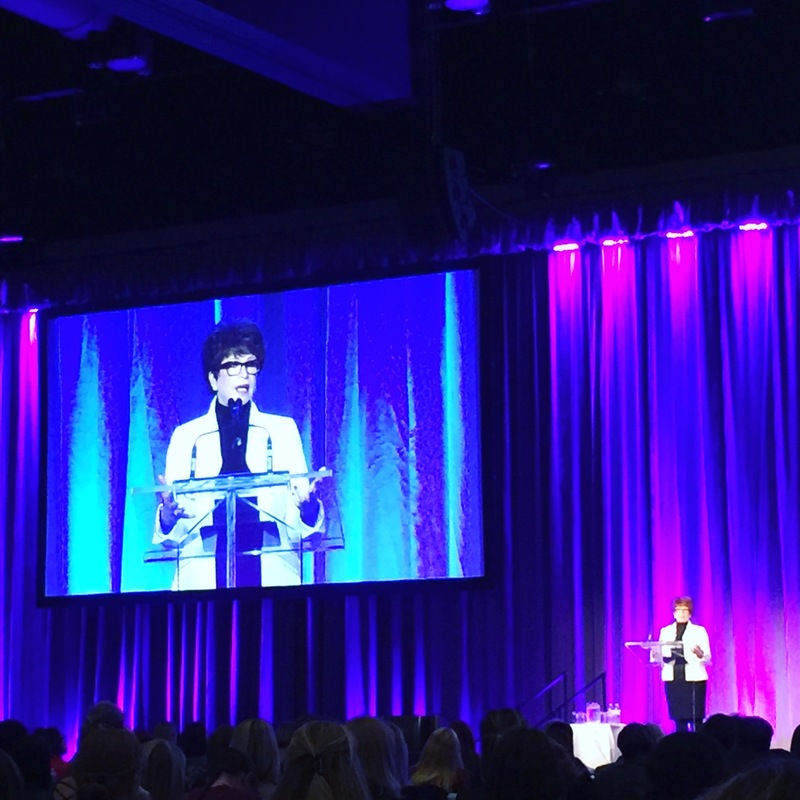 Here’s a picture of Valerie Jarrett, all-around impressive person and former senior adviser to President Barack Obama, speaking at The Art of Leadership for Women conference in Calgary this October. Houston Food Bank Help feed hungry Houstonians when they need it the most! Texas Diaper Bank Collecting baby items, diapers, and incontinence supplies. Please don’t forget feminine hygiene products and UNEXPIRED baby food and formula in your relief packs. It boggles the mind that we have to remind grown people not to dump expired goods. IHaveFoodINeedFood.com Connecting chefs, commercial kitchens and food suppliers with shelters and services who need meals. Please help me gather more links in comments to this post. Thank you, Chuck Cook, for providing several of the local aid links. NOAA Harvey Imagery Go here first. 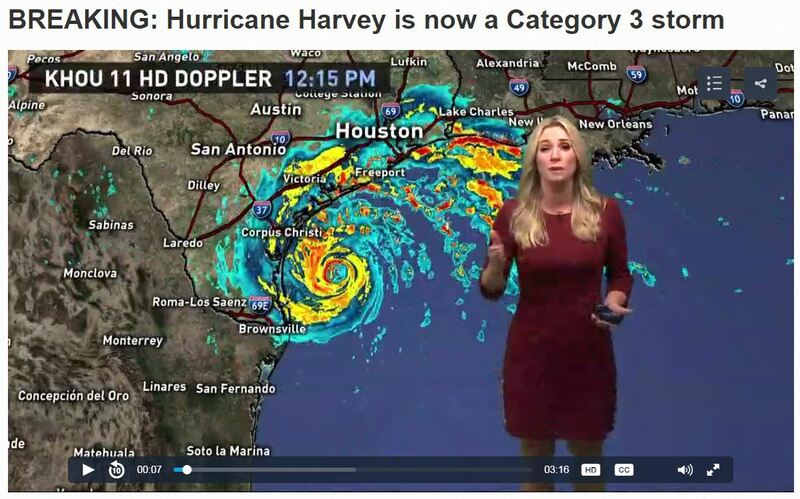 Hey, VatulBloggers, do you remember how to say HURRICANE? Now a Houston resident hunkering down for Hurricane Harvey, the blog has reawakened for some old school hurricane liveblogging. You can also find me @Maitri on Twitter and Instagram for quick updates in the case that power, wireless network, will to update blog, etc. get knocked out here at VatulBlog World HQ. Was it really 2005 when a Category 3 last made landfall on these United States? The number of and accessibility to media outlets sure have grown since then, when this medium was really the only way to reach and inform a mass audience. A dozen years in which to increase the signal, but with it grew the noise and walled gardens, so here we are. Back at the old personal, archived liveblog again, where I control the timeline and feed. 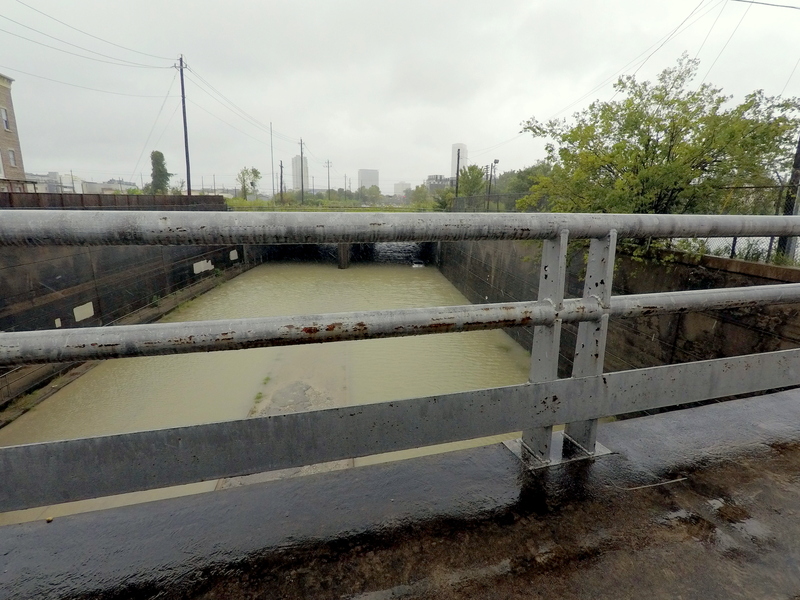 September 4th, 2017 14:27 CDT My office building ostensibly reopens tomorrow, but questions remain about mobility and safety in the greater Energy Corridor area, given the ongoing release of water from the large west Houston dams into Buffalo Bayou. Further, wastewater plants in the area have flooded and are still being repaired, raising concerns over the normal use of office buildings. I warned folks that re-entry is not going to be straightforward. September 3rd, 2017 22:45 CDT Flooding in Kingwood, where we evacuated to right before Katrina made landfall and where we slept through Rita. That smell of decay takes months, sometimes years, to dissipate completely, and haunts my olfactory memory still. There of course were some differences. Our flooding came thanks to failed levees designed to protect us, while your flooding came from rains of biblical proportions thanks to a stubborn storm that refused to leave. How you came to suffer, though, is not as important as the fact that you are suffering and for many the toughest part is yet to come. You’ll be challenged emotionally again and again and again. September 2nd, 2017 13:46 CDT Lt. General Russel Honoré, former commander of Joint Task Force Katrina and ultimate badass, says, “Stop congratulating each other.” This goes double for humblebragging by some members of the mainstream and citizen media (and Houston chef-lebrities). The disaster has just begun. September 1st, 2017 10:48 CDT Overhearing casual talk of insurance fraud and how to profit from the upcoming FEMA recovery business opportunities. But, by all means, let’s condemn, arrest and prosecute those who steal small amounts of necessities so that they can stay ALIVE DURING A DISASTER. If the moneyed thieve, they’re canny and strategic. The desperate poor looking out for themselves? Throw them in the dungeons! Teachers Aide is an organization within Houston Food Bank which gets supplies to schools and kids in Houston who need them — and they will definitely need them. August 30th, 2017 21:20 CDT ArsTechnica | This is probably the worst US flood storm ever, and I’ll never be the same by Eric Berger of Space City Weather. It’s always the tragedy after the tragedy. We never fail at making things worse. Read the paragraph below and commit it to memory. If Houston is to remain the prosperous, vibrant, great city that it was before Harvey, we are going to have to take a hard look at our unfettered development and willingness to let almost anyone build almost anywhere, including in floodplains. Our state officials are going to have to recognize that these events will be possible again, especially in a warmer world. I’m not holding my breath for all that to happen. And as dark as these last five days have been, that may be the biggest tragedy of all. August 29th, 2017 13:20 CDT Map of Houston area flooded streets. August 29th, 2017 11:00 CDT Still high and dry, but we probably have one or two more big whips of rain to get through before this system moves to the east. Not like I want it to move east over New Orleans on the 12th anniversary of Katrina or any day, for that matter. Each rescue chopper that flies southward over the house tears my heart open a little more, and once again, I feel so useless just sitting here as I did a dozen years ago. Domingo and I will head down to the George R Brown convention center to drop off clothing and supplies, and volunteer if required, and I am helping raise money for Houston Food Bank. Even a dollar you can spare will go a long way to help exhausted and hungry people in need. 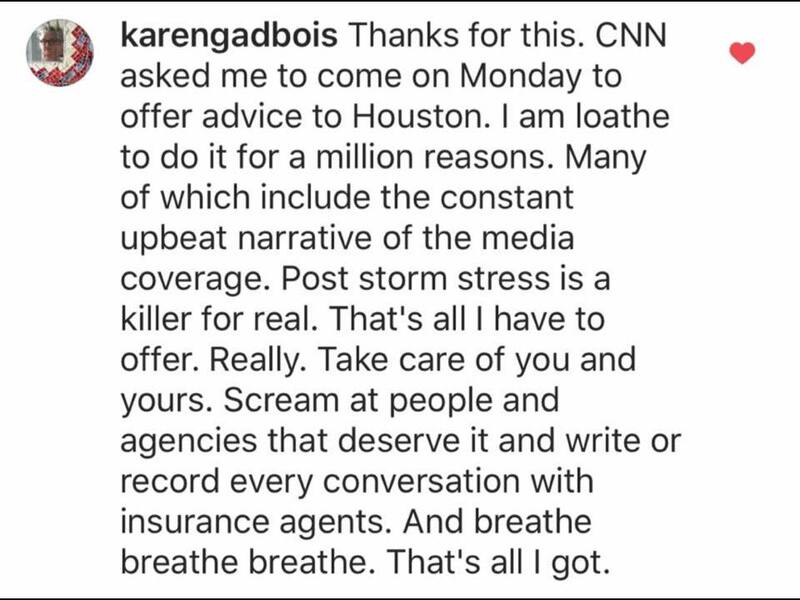 Houstonians, if you need anything, my home is open to you. August 28th, 2017 15:45 CDT Pictures from today’s survey. We managed to leave Oak Forest after checking out White Oak Bayou, made it all the way down to Sawyer Heights and Rice Military in the Buffalo Bayou watershed and then drove back home through Timbergrove and Shady Acres. The water has gone down quite a bit across the northern Inner Loop as of this morning, but expect flood levels to fluctuate over the next few days. August 27th, 2017 13:00 CDT Pictures from our mid-morning survey of Oak Forest. All major roadways out of Oak Forest are Difficult Navigation to Impassable, so stay put! White Oak Bayou has crested and has overflown TC Jester Blvd, Rosslyn and Watonga, making its way into the neighborhood. Our area within Oak Forest is an island with a wide moat forming around us. August 26th, 2017 19:53 CDT The skies were quiet all day with rain and damaging winds going around Houston’s inner loop. Well, we’ve gone from 0 to Tornado Warning, with the power flickering, winds picking up, and us preparing to take shelter in an inner room. Stay tuned. August 26th, 2017 08:00 CDT Power still on. Cable and internet out. Local rain gauge measures roughly 4″ in the last 24 hours. Harvey is now a tropical storm that is expected to sit and swirl over Houston until Wednesday morning. Great, I always wanted a large moat around my property. August 25th, 2017 22:45 CDT Neighborhood hurricane party! Harvey is making landfall right now as a Category 4 between Port O’Connor and Port Aransas. This is me at this time. Seriously, I hope everyone on the coast evacuated and we don’t hear of deaths and stranded residents in the coming days. August 25th, 2017 18:36 CDT Harvey is now a Category 4 storm ~60 miles offshore. Swell. And swell. Harris County Flood Control District, where you can find your watershed. This is mine. And don’t forget to take this Refresher Course on Hurricane Season! Only 11 days until the Society of Exploration Geophysicists Annual Meeting in Dallas! The Women’s Network Committee has worked very hard and is currently putting the final touches on a number of high-quality events pertinent to women in the field of applied geophysics. Please plan on attending at least one, if not all, of these events to grow your network, identify areas for personal and group action and help build a better geophysical society. Networking event [PDF]: Monday 5:00 – 6: 30 PM at the Omni Hotel. A brief welcome and introduction to the SEG Women’s Network on my part will immediately precede the featured Pioneers in Geophysics posters that highlight five pioneering women in geophysics. Networking will begin immediately thereafter. Tickets for this event are $20 each. Students are eligible for half-price tickets if they bring a friend. Women’s Network Breakfast [PDF]: Wednesday 8:30 – 11:00 AM at the Kay Bailey Hutchison Convention Center. The breakfast features keynote speaker Patty Walker, ExxonMobil Chief Geoscientist (pictured at top right above), and a working breakout session. The theme for the breakfast is Brand Me for Change and the breakout session is on the topic of What can the Women’s Network Committee (WNC) do for SEG members during trying times? Tickets are once again $20 each with students eligible for half-price entry with a +1. Post conference workshop – Workplace Navigating: How to Recognize and Avoid Bias and Bullying in the Workplace [PDF]: Thursday 1:30 – 5:00 PM at the Kay Bailey Hutchison Convention Center. This workshop will focus on discussing and providing tips for navigating the workplace when there is bias and bullying. It will offer strategies for dealing with the offender without triggering backlash. This workshop is timely because in the last couple of years, the industries and institutions that focus on oil and gas exploration/production have suffered significant down-sizing due to the ongoing oil burst. This inevitably increases anxiety and job security concerns in the workforce, leading to unhealthy competition which can trigger increased hostility in the work place for everyone, particularly junior staff members, under-represented minorities and female professionals. This workshop which will be led by expert sociologist, Professor Sheryl Skaggs of the University of Texas at Dallas (at bottom left in the picture above). I really look forward to seeing you all again in Dallas! If you plan to follow along at home, I will be live-tweeting via @maitri and @SEG_WNC with the hashtag #SEGAM2016.